One of Nikon's flaghip models, this is a super performer with masses of features. Powerful and packed with professional features, the streamlined Nikon D750 is a Digital SLR that stands out from the crowd, allowing you to take awe-inspiring images in both still and video formats. The Nikon D750 is compact, for an SLR at least, and makes the ideal travel partner for both professionals and ambitious amateurs. 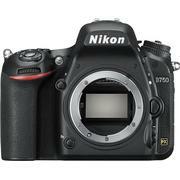 Although the D750 is the smallest of Nikon's FX cameras, there’s absolutely no compromise in quality. With an impressive 24.3 megapixels and a newly designed FX-format sensor, this camera provides cleaner and richer results than any of us are used to at high ISOs, and with EXPEED 4 image processing technology, you can see the results of your work the second you press the shutter button. With a remarkably sensitive and rapid autofocus and a burst rate of up to 6.5 fps the D750 can take exceptional action shots, never missing a beat. And with an ISO range from 100 to 12,800, you can shoot pictures regardless of light levels – both too high and too low. The wide angle lens and fabulous control system, amongst many other great features, provides you with everything you need to take images of a professional standard in any situation. Nikon has gone out of its way to improve the video recording functionality of the D750, leading to full HD movie recording in 1080p at 60 frames per second. And while still filming you can change your ISO, shutter speed, framing and sound levels with a simple click of a button; allowing for total control and instant adjustment of your recording. The camera's robust tilt-screen lets you keep tabs on your footage from multiple angles. The Nikon D750 has an excellent editing function called Picture Control 2.0, giving you total control over contrast, saturation, brightness and so on while taking still or moving images. Instant post-production editing is available with a range of useful adjustment options. Settings once again can be altered while you shoot, and you’re also able to save different sets of options for movies and stills with dedicated menus. Never run out of memory – the Nikon D750 comes equipped with slots for two memory cards. Both slots are compatible with large SDXC cards and UHS-I cards. And finally the Nikon D750 is Wi-Fi enabled so you can quickly send your images to a phone or tablet without needing a cable. Why you should buy it:' Overall this is an excellent high-end Digital SLR – punchy, compact, and loaded with features. It’s quite simply one of the best cameras you can buy in the UK.